As campaigners across England, we are sounding the alarm over the potential impact on health care services of the 44 Sustainability & Transformation Plans being drawn up in secret at the behest of NHS England. Drafts of all 44 plans were submitted in July: but as of this weekend only 6 relatively complete drafts have been published – for North West London, Hampshire and Isle of Wight, Dorset, the Black Country, Wider Devon and Shropshire. These plans all centre on achieving drastic “efficiency” savings, to stave off projected “gaps” between needs and resources reaching into hundreds of millions of pounds. The North West London draft makes clear that most of the core savings are to come from old fashioned cuts – closing hospitals, centralising services, squeezing more “productivity” from already hard-pressed hospital staff, redundancies and dumping more unpaid tasks onto GPs and primary care services, as well as onto family carers, overwhelmingly women. The proposed new models of “out of hospital care” will also open the door to selling off NHS estate to fund the NHS deficit, as well as further privatisation – contracting out for US-style “accountable care partnerships” and for “Multispecialty Community Providers”. We do not oppose genuine integration of health and social care but reject any moves towards “innovations” that involve replacing highly trained professional staff with fewer, cheaper, lower skilled staff, or contracting out or privatisation of health care provision. We note the current disastrous fragmentation, underfunding and widespread privatisation of social care, making a comprehensive integrated service impossible. 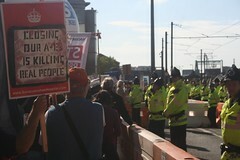 We note the impact and partial victories that have been won by broad-based campaigns in various areas – defending Manchester mental health, in Shropshire challenging the ‘Future fit’ proposals, in Staffordshire & Cambridgeshire exposing “lead provider” contracts, in NW London linking with two boroughs to fight closures, and more – and the success of campaigners in mobilising large protests in Bristol, Huddersfield, and Banbury. local hospitals – and urge other local councils to take a similar stand wherever services are at risk. The relentless squeeze on funding, initiated in 2010 by George Osborne, is set to continue until 2020, freezing health spending in real terms and effectively each year falling behind the increases in population and upward cost pressures on the NHS. The delegates here oppose the STP plans as fundamentally flawed, driven by cuts and by undemocratic NHS managers. 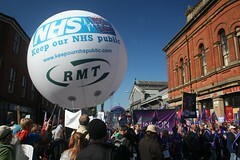 We believe they will further fragment and privatise the NHS. 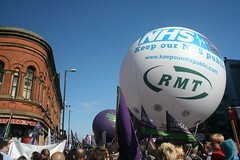  The full re-instatement of a comprehensive, universal, publicly funded, publicly owned, publicly provided and publicly accountable, national health service which is free at the point of use and has the resources needed to provide excellent health care for all on a long term, sustainable basis.  A halt to the cash squeeze and for additional government funding, from progressive taxation, to restore the real terms budget of the NHS.  Councils to refuse to sign up to STPs until a satisfactory conclusion to the public consultation is reached, and work with the local public to develop clear red lines around all NHS services.  With trade unions and other partners to increase the level of awareness among health workers, professional bodies and health trade unions of the dangers of STPs. It is clear from the STP Drafts that the bulk of future savings are to come from closures, job losses and further demands on NHS staff, whose real terms wages have already been reduced by upwards of 16% since 2010.  With broad based campaigns within communities, encouraging links with health workers in hospitals, primary care, community and other settings in defence of their jobs, pay, safe staffing levels and conditions.  With political Parties at local and national level to build active campaigning. We will build STP Watch as a resource and build the broadest possible united campaign to prevent STPs undermining access to local services and the quality and quantity of health & social care for all.  We will organise a national day of local action in opposition to STPs.  We also support the struggle of the junior doctors against the contract being imposed on them by NHS England. 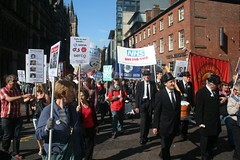 They are in the forefront of the fight to defend the conditions of service of all public sector workers within the NHS. 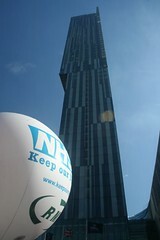 STP Conference, Health Campaigns Together.